No other clinician today can begin to match Lynn Palm Pittion Rossillon’s first-class reputation and proven performance record as an all-around trainer, showman, exhibitor, and entrepreneur. Some of Lynn’s notable accomplishments include: 34 World and Reserve World Championships; Four Superhorse titles; American Quarter Horse Association (AQHA) Female Equestrian of the Year; bridleless exhibitions with the legendary Rugged Lark at the 1996 Atlanta Olympic Games, National Horse Show, The Washington International, and the International World Cup; 2003 Equine Affair Exceptional Equestrian Educator Award winner; 2006 AQHA Professional Horsewoman of the Year; and Women’s Sports Foundation 2000 Female Equestrian of the Year. 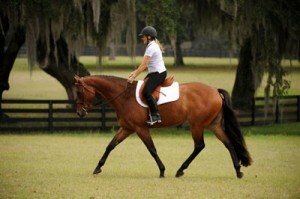 Lynn and her husband Cyril Pittion-Rossillon conduct Palm Partnership Training courses at Fox Grove Farm in Ocala, Florida, and at Royal Palm Ranch in Bessemer, Michigan, and Lynn’s “Ride Well” clinics are offered across the country. Visit her website at www.lynnpalm.com.